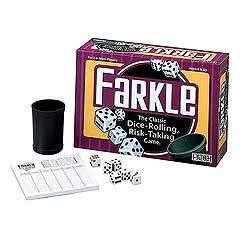 Become a Farkle fanatic with this classic dice-rolling, risk-taking game. Take a risk and keep rolling to build your score. Or play it safe so you don't lose your points in a Farkle. It's a fight to the finish in this fabulously fun game of strategy and luck!